These old time ginger beer recipes were among the first carbonated soft drink recipes published. The rich, gingery flavor of this refreshing, effervescent nonalcoholic ginger beer is still popular today. Homemade ginger beer sparkles in the glass and has a very pleasant and truly unique flavor — fresh, spicy, yeasty, and with just the slightest hint of alcohol. It has an amazing taste. You'll love it. Loaf sugar, 2-1/4 pounds; cream of tartar, 1-1/2 ounces; ginger root, 1-1/2 ounces; 2 lemons; fresh brewer's yeast, 2 tablespoonfuls; water, 3 gallons. Directions: Bruise the ginger, and put into a large earthenware pan, with the sugar and cream of tartar; peel the lemons, squeeze out the juice, strain it, and add, with the peel, to the other ingredients; then pour over the water boiling hot. When it has stood until it is only just warm, add the yeast, stir the contents of the pan, cover with a cloth, and let it remain near the fire for 12 hours. Then skim off the yeast and pour the liquor off into another vessel, taking care not to shake it, so as to leave the sediment; bottle it immediately, cork it tightly; in 3 or 4 days it will be fit for use. White sugar, 3/4 pound; cream of tartar and gingerroot, bruised, each 3/4 ounce; juice and grated yellow of 1 lemon; water, 1 gallon; fresh yeast, 1 tablespoonful; essence of wintergreen or sassafras as you prefer, or half as much of each, if a mixed flavor is liked. Directions: Put all into a jar, except the yeast and essence, and pour out over the water, boiling hot; cover, and let stand until it is only lukewarm, and add the yeast and essence, and let stand in a cool place 24 hours; strain and bottle, securing the corks tightly. It will be ready in about 3 days. More or less flavor may be used to suit different tastes. Boil 2 ounces of best white Jamaica ginger root, bruised, in 6 quarts of soft water; strain, and add 1 ounce of cream of tartar and 1 pound of sugar. Put on the fire and stir until the sugar is dissolved, then pour into an earthen jar and add 2 drams (1-1/2 teaspoons) of tartaric acid and the grated rind of one lemon. Let cool down to the surrounding temperature, add 1 ounce of fresh yeast, stir well and bottle at once, tying the corks down firmly. The "pop" will be ready for use in two or three days if the weather is warm, or if kept in a warm place. This old fashioned soft drink recipe includes a humorous recollection of a youngster's brewing experience. Ground Jamaica ginger, 1-1/2 ounces; cream of tartar, 1-1/2 ounces; brown sugar, 1 pound; 2 lemons, sliced; boiling water, 4 quarts; yeast, 1/2 package (use 1 package dry yeast in 1 pint of the water, lukewarm). Mix all ingredients together in a large stone crock or crockery bowl; allow to ferment for 24 hours; bottle. Brew will be ready for use in 2 weeks. I recall, as a child, my mother's mystification at my brother's sudden indifference to raspberry vinegar until a series of loud explosions led to the discovery of a ginger beer still in our cellar, fermentation having been speedier than the recipe had indicated. The young brewer had secured the corks of the stone bottles with wire. Loaf sugar, 1 pound; rasped ginger, 1 ounce; cream of tartar, 1 ounce; boiling water, 1 gallon. Mix and cover them up close for one hour, then add essence of lemon, 15 drops; yeast, 2 spoonfuls. Strain, bottle, and wire down the corks. Take best white Jamaica ginger root bruised 2 ounces, water 6 quarts, boil 20 minutes and strain, then add cream of tartar 1 ounce, white sugar 1 pound; put on the fire, then stir until all the sugar is dissolved; then put into an earthen jar, now put in tartaric acid 1/4 ounce, and the rind of 1 lemon, let it stand until 70°F, or until you can bear your hand in it with comfort, then add two tablespoonfuls of yeast, stir well, bottle for use, and tie the corks; make a few days before it is wanted for use. Put into a kettle, two ounces of powdered ginger (or more if is not very strong), half an ounce of cream of tartar, two large lemons cut in slices, two pounds of broken loaf sugar, and one gallon of soft water. Simmer them over a slow fire for half an hour. When the liquor is nearly cold, stir into it a large tablespoonful of the best yeast. Bottle for use. Some old fashioned recipes call for loaf or lump sugar, which was the form in which the sugar was once sold. Refined sugar was not sold in its present-day granular form until the end of the 1800s. It was sold in a cone-shaped, solid block that was rounded at the top, and it often had to be broken into lumps and clarified before use by boiling it with water and white of egg to remove its impurities. Any of today's granulated sugars can be substituted in recipes without clarifying. However, the type and quantity of sugar you use will affect both the flavor and the color of the finished product. Dark-brown sugar will create a dark-colored soft drink and white sugar will create a light-colored soft drink. Brown and white sugars are about equal in their degree of sweetness, but brown sugar also adds its own distinctive flavor and color, and is excellent for use in some beverages. Just experiment to learn your preference. It's rare to find commercially bottled ginger beer that's naturally brewed these days. Most beverage bottlers force carbonate their soft drinks by inserting carbon dioxide (CO2) gas into the beverage mixture. And although it's an easy and convenient carbonation method, it loses the old fashioned yeasty taste of natural fermentation. However, there are some bottlers who refuse to compromise and continue to maintain the Old World traditions. Fentimans (pictured at right) is one brand of commercial ginger beer that I really enjoy drinking when I'm too lazy to make my own. Not only does Fentimans use the finest ingredients, such as premium ginger root and quality extracts of yarrow, juniper, and speedwell, but they employ a traditional 7-day brewing and fermentation process. You can tell Fentimans is the real deal because the label on each "Botanically Brewed" bottle instructs to "Upend Before Pouring" thereby allowing the bits of fermented ginger to mix throughout the beverage for maximum flavor enjoyment. 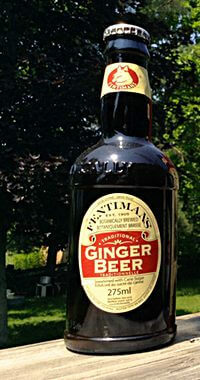 Compared to typical North American ginger beers, Fentimans has a unique, less-sweet taste because of the true fermentation process. It's the real McCoy. While on a visit to Edinburgh, I enjoyed a chilled Great Uncle Cornelius's Ginger Beer in the HM Yacht Britannia's Royal Deck Tea Room. Bottled by James White, it's a "still" ginger beer, meaning it's not carbonated. The fresh and tangy flavor of pressed ginger juice is blended with apple juice to produce a smooth tasting beverage that's very refreshing at any time. 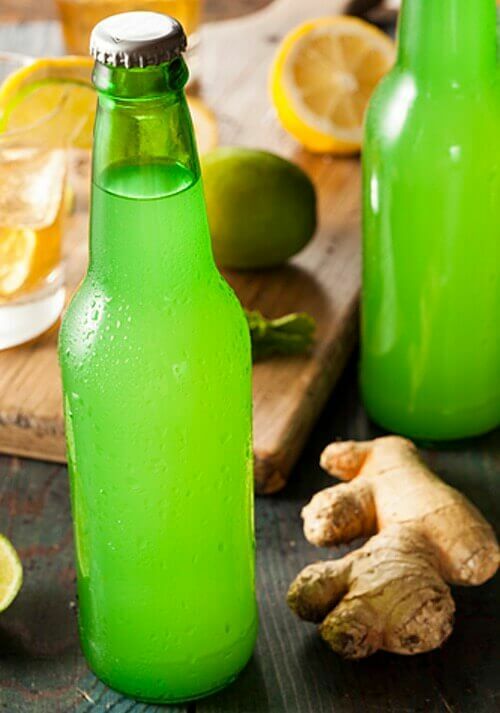 By experimenting with the old fashioned "Unfermented Ginger Beer Recipe" found on this page, you can produce your own "still" ginger beverages. By experimenting with the old fashioned soft drink recipes, you will get to experience the wholesome and delicious soft drink your great-grandparents once enjoyed as children. Once you taste homemade ginger beer, you'll love it. It's from these earlier beverages that our modern ginger ales evolved from. From the time I was a kid, I've always loved the taste of ginger ale. But, when I finally got to taste homemade ginger beer... WOW! Yes, making it does require some time and effort, but once you try it, you'll love it. Enjoy trying these old fashioned ginger beer recipes. Making your own soda pop is lots of fun, and it's so very easy when the little secrets have been mastered. Simply follow the old recipes, adjusting the quantities when needed. Soon, with patience and some practice, you will become an accomplished ginger beer maker. Get all your home soda fountain supplies and flavored syrup concentrates from The Prairie Moon Company, your one-stop source. Reliable low cost shipping to U.S. and Canadian customers. I highly recommend them!